Well, it took me ALL day to get here but I finally made it! 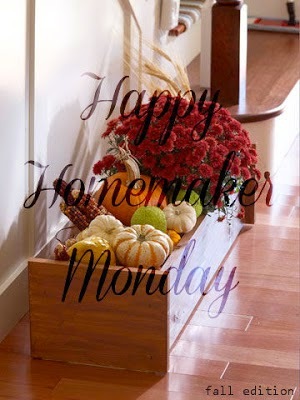 So glad you could join me for Happy Homemaker Monday. Our weekly host for Happy Homemaker Monday is Sandra at Diary of a Stay at Home Mom. I hope you stop by to visit her and the other participants. I will announce the winner of last week's drawing tomorrow. Wednesday is a fast day so no breakfast for this girl! Yesterday we made sauerkraut (and will make more tomorrow). Today I filled our food dryers with grated Jujubes. Things look a little crazy around here but will soon be back to normal:) Hmmm...what is normal anyway?!!! Laundry...I got the bedding washed and line dried today. Tomorrow it looks like I have a load of dark clothes waiting to be washed. Food Preservation...As mentioned before, I had some Jujubes that needed drying. Previously I had cut them in half, removed the seed and put them in the food dryer. This was laborious as the fruit didn't give up the seed without a fight! So I went online to Taylor-Made Ranch Homestead Blog and decided to try grating the fruit off the seed. It was so much easier and faster. The blog author said the easiest way she has found to remove the seed is with a handheld cherry pitter. I will try that next. Stampin' Up!...I am still trying to get ready for Wednesday's stamping club. Crocheting...I am still working on the yellow baby afghan. I am also working on a pretty pink scarf and earwarmer set for a three year old (nearly finished). I need to start working on some clothes for my granddaughter's American Girl doll. Cooking...We cooked a HUGE beet today for lunch; it weighed 3 1/2 pounds...one beet! It was chilly and cloudy today; very fallish! I was really enjoying the warm weather last week but alas, I think Fall has settled in. Catch up on Words with Friends! I am really enjoying it! I am looking forward to trying a recipe for Artisan bread. I just need to order the stoneware covered bread pan and the proofing bowl. I got the starter from my daughter's friend, Selina, along with instructions. Hanging clothes outside! I will soon be drying everything in the dryer for the winter but I am enjoying the last few decent days to dry outside. Taylor-Made Ranch Homestead Blog was a fun one for me to read today. If you are interested in homesteading, you will love Tammy's posts. Well, that's it for me today! I will be back tomorrow with Tasty Tuesday and the winner of last week's drawing! Thanks for stopping by! You won't have many more days to dry clothes outside before that's it until spring. You are so right! I had to dry clothes in the dryer today but hubby says I should have a few nice days next week. They are getting fewer and fewer however.